These throwing star magnets send the message that you mean business. The two rare-earth magnets hidden in the shortened point of each shuriken will stick them to any magnetic surface, such as refrigerators, cars, or some parts of your walls. They make a great gift for your ninja roommate. Available on amazon. 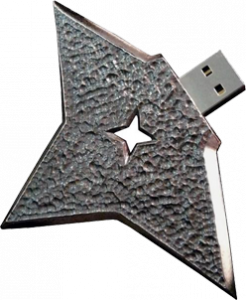 Update: There are also some awesome push pin shuriken. Update: A throwing star coat hook. What era came before the Flintstones? If Sci-Fi had a steampunkesque genre pre-dating the stone age, this guy would be its king. Michael Rea, a sculptor from Chicago, made this suit in honor of Stephen Hawking out of wood, ropes, and pink foam. Why pink? because it’s cheap. He sets himself a hundred dollar wood budget each month for his projects. American ingenuity at its best. 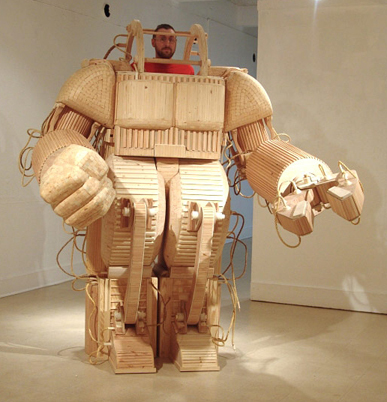 There is nothing like breaking out the power tools and lumber to build yourself a giant mech suit in the garage. Click on the image to check out his work along with an informal interview with the artist. The enterprising individuals over at The Play Coalition (I’ll get you a link if one comes back into existence) have created a monster. 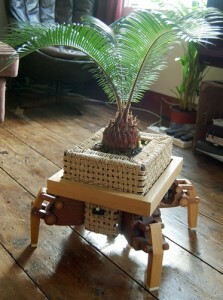 This little palm now has legs, so that it can follow that sunbeam that moves across your living room floor each morning. In my house it would also need to learn to run away from my cat and go grab itself a glass of water when it gets thirsty. Unfortunately, by the time it gets that smart, I imagine I’d find it going through my fridge looking for beer and pizza. Click the image to see PlantBot in motion. Graffiti is one of the most controversial art forms. Made most famous by vandals, it tends to be used mostly in a somewhat territorial defacing of property with motivations varying as much as any other art form, if not more. It is one of our most ancient arts, with cave paintings dating back at least 32,000 years, many of them less socially acceptable than the standard bison image that comes to mind. 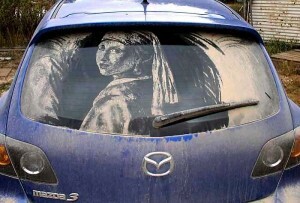 Reverse graffiti is the art of removing grime or graffiti in such a way that it leaves a message behind. The artist can vary all the way from that kid who scrawls ‘wash me’ with their finger on all the dirty cars they see, to masters like Scott Wade (top) and Alexandre Orion (video below). As you can see from the video, the legality of reverse graffiti is still leaving officials scratching their heads. Are they really going to arrest you for cleaning the subway? As with anything that irritates people or costs them money (£750,000 to (finish) cleaning the Wills Memorial Building in Bristol) expect them to manage to trump up some kind of charge if you get caught making a nuisance of yourself. Rapid prototypers are falling in price, but are still expensive to use, and the field of swarm robotics continues to work on making better bots with more useful emergent behavior, but today, the hardest working hives on the planet are still organic. 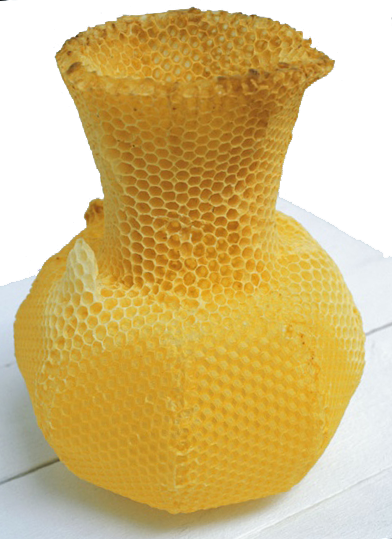 Tomas Libertiny made a form for his hive in the shape of a vase and then let the bees do the rest. It took 40,000 of the little ladies a week to make the vase. The materials are free, as the bees gather them themselves, and even better, they work for queen and country. I was spoke with a beekeeper this morning who has been working on something similar, and others have made use of the concept in the past, inclding Garnett Puett, who twenty years ago apparently put a queen bee in a life sized cast of his wife and let them sculpt a work known as Apiscaryatid, but I have yet to see a picture. 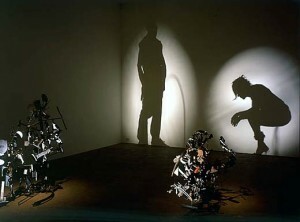 Hilary Berseth has some wonderful slow prototyping work that can be seen here. 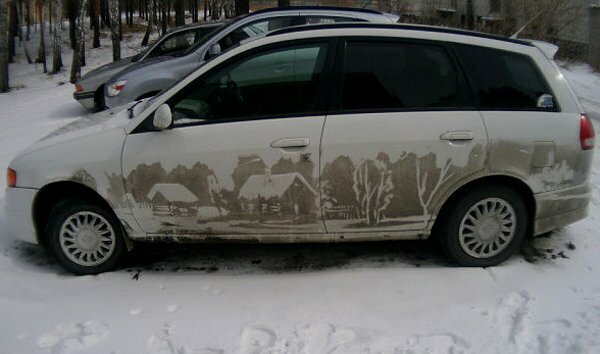 I think it would also be fun to use a lost wax process to cast the final product in a more permanent material. Next thing you know, the Danish will be using slow prototyping termites to make their clogs. Update: It looks like Libertini is still at it. 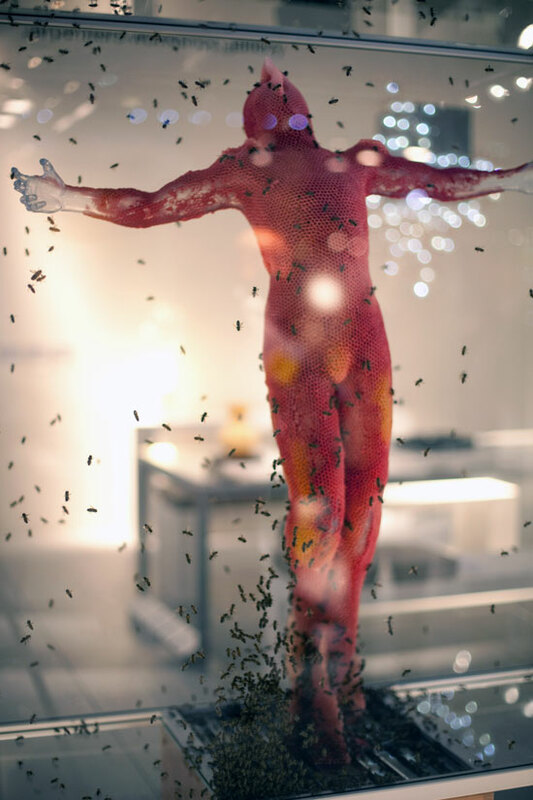 He has taken on a project much like Apiscaryatid, creating a life size figure of Jesus in a glass case entitled Unbearable Lightness. He started with a mesh small enough to trap the queen within, but large enough to allow the workers through. 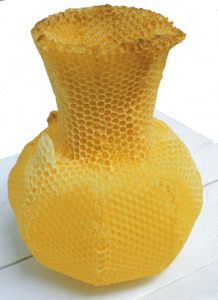 The bees built the honeycomb, filled it with honey, and then removed the honey when they were later relocated, leaving just the honeycomb structure behind. Why he chose the religious iconography I don’t know, but it scares the beeJesus out of me. 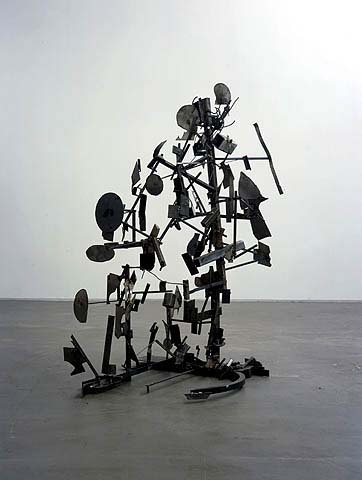 At first glance, this work of art by Tim Noble and Sue Webster looks like just another nondescript stack of stuff someone is trying to pass off as modern art. 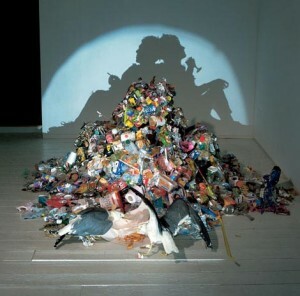 The magic happens when the spotlights are turned on. 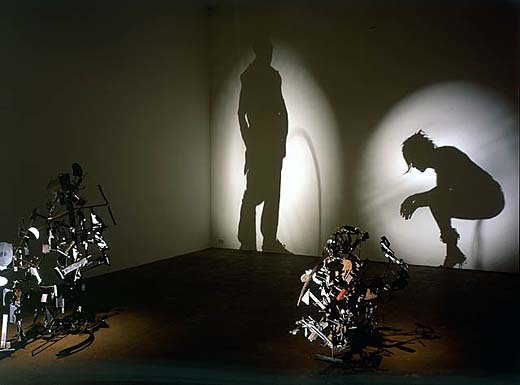 When the light is set to hit at just the right angle, the sculpture casts a silhouette in shadow; a self portrait of the artists. Last week in Friedrichshafen in southern Germany, there was an airship regatta (race). Along with the usual group of speedy nearly uncontrollable little blimps was this beauty which will be sure to be getting a lot of attention in the coming weeks. Team LaChLuVe has set the bar so high with their Fi-Fi- Fin-Fish that the airship races will never be the same, and may have a lot of new applicants. Unlike the propeller driven blimps and zeppelins, the air fish glides through the air propelled by a very natural looking swish of the tail, which also provides steering when holding it in place and gliding. The pectoral fins are servo actuated for additional control. I would be shocked not to see this as a consumer product within the next couple of years, and I can’t wait to see what shows up at the world air games next June. Update: The Fi-Fi- Fin-Fish was made by Empa (a Swiss materials technology development institution) by using electro-active polymers to power the motion of the tail. When electricity is applied, the polymer contracts like a muscle to give the tail its kick. The fins, in combination with the low center of gravity, do a great job of keeping it upright. There is a further abstract for a more complex system with a flexing body here. A flexing strip along the top and bottom of the fish would be attached to the vertical ribs. The contraction of the polymer would cause the body to flex in a more natural fashion. Part of their vision is creating a solar powered version that could operate efficiently and silently for surveillance. There is a growing demand for spy drones, and most of their competitiors sound like flying weed-whackers.